Spanish Pro Football – Sport Management is a sports development consultancy specialising in management, coordination and implementation of football projects aimed at optimising and managing activities and sports facilities. The training academy includes technical school, training, and the management of tournaments. We give a complete service to our customers. 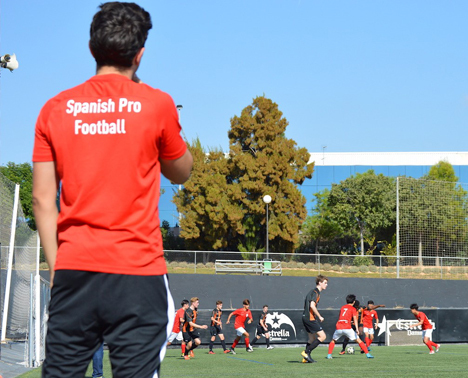 SPF Academy: school of high performance sport training , is based in Valencia. We welcome young football players from different countries and we create a personalised program, combining different services related to physical preparation and training in the field. We also integrate our Academy players into different Spanish clubs, which supports the progression and improvement of each player. All of this is combined with specific sports training and language, participants will have the opportunity to visit different top Club academies and Stadiums of “La Liga teams” where many major matches take places. to be interested in learn the football methodology used in Spain. With that program the participants can live an unforgettable experience feeling like professionals and having the opportunity to be involved in different football contexts. Valencia is on the east coast by the Mediterranean sea. Valencia is the third-largest city in Spain after Madrid and Barcelona, with around 800,000 inhabitants. There are supermarkets, markets, shops and shopping centres. There’s a supermarket next to the hotel. The city has a good public transport system, there’s a metrostation right opposite the hotel in Manises that takes into Valencia city centre in 15 minutes. There are many interesting places to visit such us: The City of Arts & Science, Bio Parc, L’Oceanogràfic, Seaside/ Port. The most famous yearly celebration in Valencia is «Las fallas» in March. The name refers to both the celebration and the monuments burnt during the celebration.